Use the hot wire probe (thermal anemometer) to determine flow velocity and volume flow in ventilation ducts or at plate outlets and ventilation grilles. It is particularly suitable for low and medium flow velocities up to +20 m/s. The probe can also measure temperatures up to +70 °C at the same time. The hot wire probe is equipped with a telescope, which can be extended to a maximum length of 820 mm. 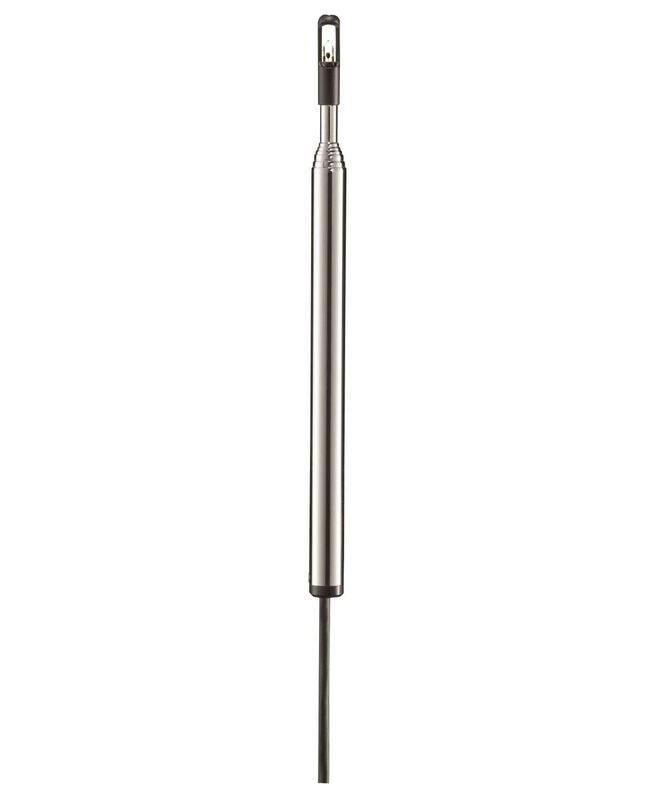 The small probe head diameter of 7.5 mm makes the probe ideal for use in ventilation ducts with small holes. To determine the volume flow of the exhaust air at plate outlets and ventilation grilles, the probe and measuring instrument should be combined with the testovent 410 or testovent 415 volume flow funnel (both optionally available). Hot wire probe (Ø 7.5 mm) with telescope (can be extended to 820 mm) including fixed plug-in head cable.